Truly love the dress, it was exactly what I wanted! The only complaint I would have is that I ordered two of the exact same dress in two different sizes and one of the dresses ripped in the front the first two hours of wearing it. 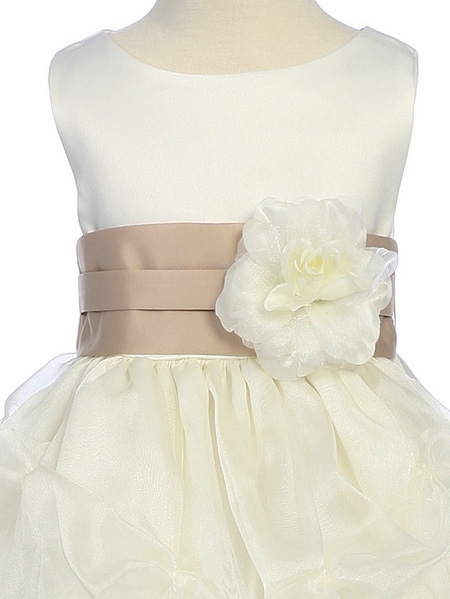 My daughter wore it as a flower girl dress and we were able to hide the rip well enough through the wedding. When looking at the picture on the website, this dress appears to be breath taking.....but when you get it...it's another story. I wish I would have listen to the previous review "worst quality" but thought I would give it a shot since there was a couple of good review. I also referred a cousin, and her daughter dress wasn't up to par either....Lesson learned. We apologize for the situation in regards to your order. 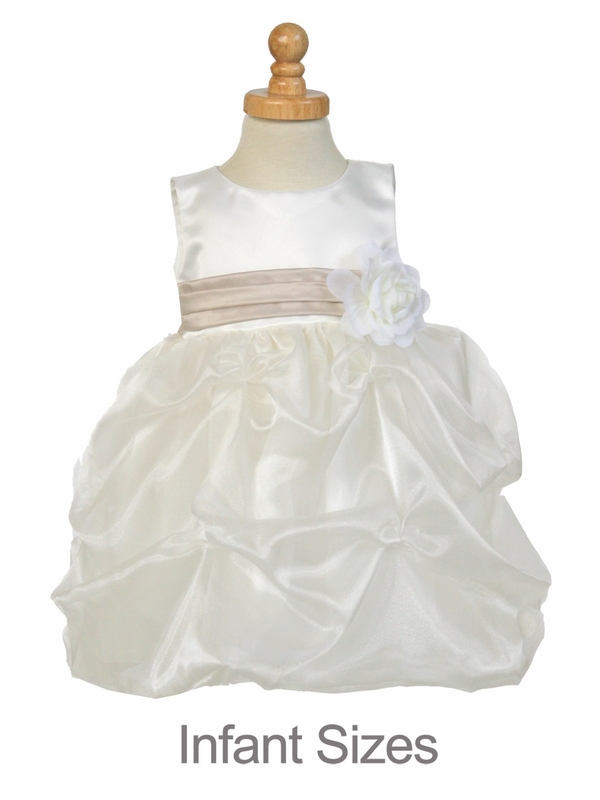 Organza is a very delicate material. 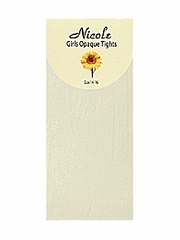 Ideally, this and most of our styles are meant to fit at or about tea length (mid-calf) to avoid damage and for safety reasons. For exact dress measurements please refer to the size chart for this style. We have had so many customers who have ordered this and loved it. It is one of our most popular styles. 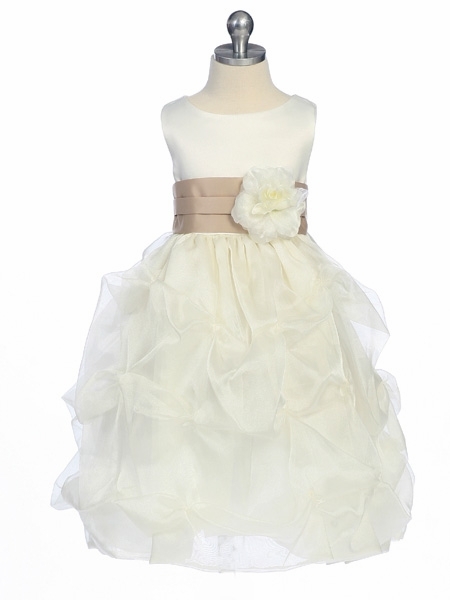 I was really excited about this dress for my 3 year old daughter as it was her first time being a flower girl for a wedding. Once I received it I thought it was the perfect dress on her and she looked like a princess in it. I especially loved the sash and flower. My daughter got her hair done in curls and looked absolutely precious. About 45 minutes after we put the dress on her however it started to rip and it just went downhill from there. It was obviously made of really cheap fabric because the entire bottom came down and it was too long for my daughter to walk around in so we had no choice but to pin it up. It didn't do much because it stil continued to rip. My daughter kept on begging me to change into her jeans and tshirt that she came to the hall in but we didn't even get through the first round of pictures when this took place. After pictures it got worse and the dress ripped even more. I felt bad that my daughter was sitting because she could barely walk around in it and the pins didnt help, so after a few hours of dealing with pinning it back up and hearing her cry and complain, I ended up tearing the remaining part of the bottom half so the slip of the dress was the only thing that remained on the bottom half of the dress. It was cheap and all I had to do was tug on it slightly in order for the rest to come off. I am extremely disappointed in the quality on the dress. 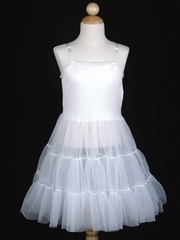 I shopped on The Childrens Place prior to purchasing this dress and they had cute dresses for a flower girl but I wanted something a little more special. I should have stuck with them at least I know they have excellent quality and their fabrics would never rip after ONE night of use. The dress you send me was such poor quality you should be ashamed to sell such an item. Please dont make the same mistake as me and do NOT purchase this dress. Fast shipping and great customer service! 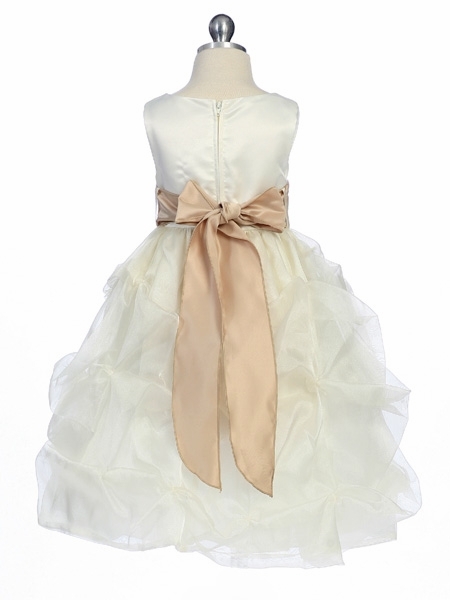 I ordered three of these dresses in ivory/champagne for my flower girls. The bridal store where I bought my dress wanted three times this price. These are very similar in quality and I am so impressed with them. 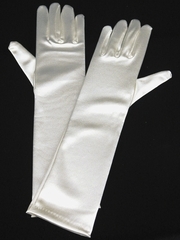 The champagne sash offsets the ivory color (which is a light ivory) perfectly. The pick-ups look so beautiful. I had one flowergirl try hers on already and she looks like an adorable cupcake. The bow in the back will also photograph well. So excited for the girls to wear these on the big day! Thank you Pink Princess.